Saudi Arabia, Riyadh, 02 January 2019: Mr. Bander Al-Mohanna, the Chief Executive Officer of flynas, the Saudi national air carrier and leading low-cost airline in the middle east, revealed that flynas has carried about 6.6 million passengers on 60,000 domestic and international flights during 2018, noting that the increase in the number of passengers is a result of the increasing number of flights and destinations in line with flynas’ expansion plans to meet its passengers’ needs. Mr. Al-Mohanna stressed that the growth rate in passenger numbers is an extension of flynas’ previous successes and expansion plans in the domestic and international market, as it has launched 11 new destinations in 2018. He added, “this year’s flynas results confirm that it continues to be the best travel choice in the Kingdom, which further enhances our future ambitions to expand and reach new destinations”. He also noted flynas’ achievements, as it has won the prestigious Skytrax Award twice in a row (2017 and 2018) and Middle East’s Leading Low-Cost Airline from the World Travel Awards for four consecutive years (2015, 2016, 2017, and 2018). Al-Mohanna stated that flynas’ domestic flights has carried about 4.3 million passengers, while the total number of passengers on international flights exceeded 2.3 million in 2018. He also said, “the increasing number of passengers on our flights reflects our relentless efforts to improve passenger experience and develop plans to boost growth. We have expanded our domestic and international destinations as well as our strategic partnerships with Jet Airways, Pegasus and Etihad Airways”. 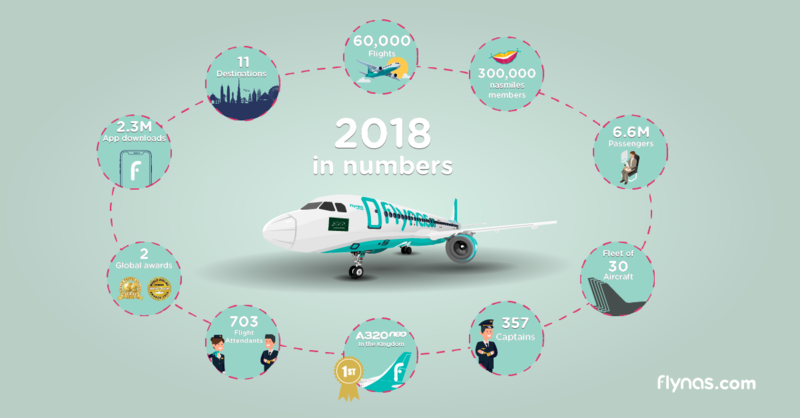 In 2019, flynas will continue with its expansion strategy, and new destinations will be launched on a new fleet of 120, A320neo aircraft purchased from Airbus for a total value of 32 billion riyals, to be delivered successively in 2019.